with 21 years or older in age to participate in the democratic process. However, out of the 173 million voters at that time, most were illiterate and poor, residing in rural areas, and thus were without any experience about elections. The Indian National Congress, founded in 1885, proposed economic reforms and demanded a greater role when the British policy for India was being prepared. Later on, in 1907, the Congress divided into two sections: a moderate group that demanded dominion status for India, and a militant section that was for self-rule. However, in 1920, the Congress, under the leadership of Mahatma Gandhi, started its passive resistance movement against the British policies. Later, during World War II, when India was attacked by Japan, the Congress demanded a democratic government from Great Britain in return of support in war efforts. However, the British arrested the prominent leaders of the Congress﻿ and banned the organization. In the 1946 Indian constituency elections, the Congress lost its Muslim vote to the Muslim League, and so could not avert India's partition at the time of independence in 1947. Organizing the first-ever elections in India was an arduous task and it took around four months: October 25, 1951 to February 21, 1952 to get over. Though the Indian National Congress was the largest political party in India at that time, favorable atmosphere was created for opposition parties too to take part in the elections. The list of opposition parties included the Jansangh and the CPI. It was the INC that tried its best at all levels to win the interest and trust of people across the nation. In fact, Jawaharlal Nehru, in his election campaigning, approached about one tenth of India's population, or 35 million people, by covering about 40,000 km. Around 170,000 candidates wanted a chance in the state assemblies for around 3,278 seats. Besides, there were 489 seats to be filled in the Lok Sabha, for which around 1,800 candidates contested. In the 1st Lok Sabha Elctions in india the Indian National Congress party stood to win in the majority of the states. The party won with around 45% votes all over the country. 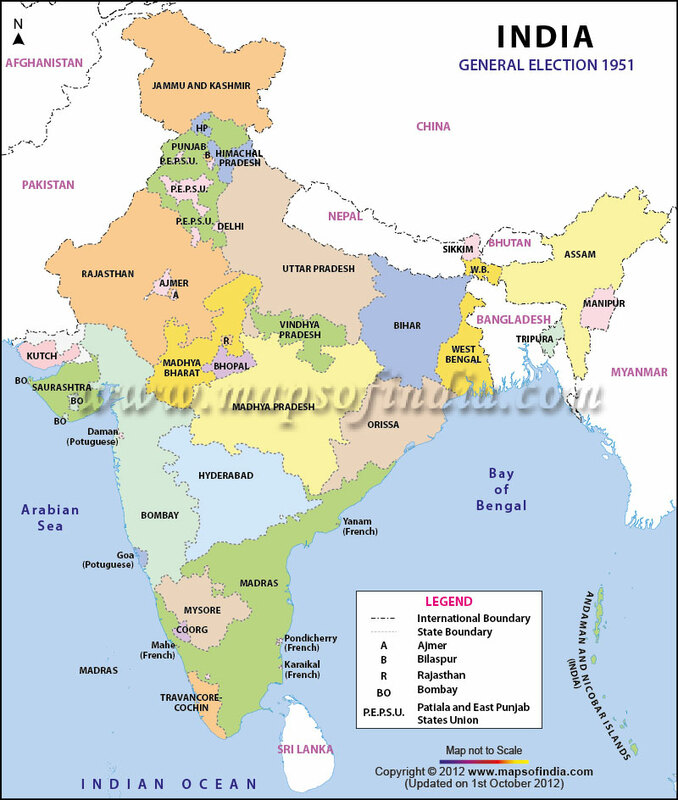 The election was held in 26 Indian states and 401 constituencies. In the opposition comprised of Dalit leader B.R. Ambedkar, Shyama Prasad Mookerjee, Ram Manohar Lohia, Acharya Kripalani, etc. Below is a table showing the results for the 1951 general or the 1st Lok Sabha elections state wise.